"I wanted to let you know that I am in receipt of the most divine piece of art that I have ever laid eyes on. It is the most stunning manifestation of soul that I have ever come into contact with. Not only is it beautiful by means of personal perception, the soul seed of intent as it is projected onto the mat is simply magical." - Erin owner/writer of Ailin blog, an eco fashion conscious mecca resource. Click the yoga mat to connect to her site. 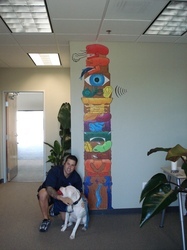 "My wife and I hired Aline last year to paint a mural on our office entry wall. It is pretty simple and summed up in not too many words: consistent with her art, talented, spot on with what we wanted, creative in adding to what we wanted, affordable for what you get, great spirit, trusted her with the key to our place when we were not there and a great person.....plus her dog has to be the best soul in the world! We are actually going to call her soon to hire her again to paint some more! She is one of the best around!" My much delayed response on my experience in purchasing the "My Yoga Place" mat for my husband/partner for his birthday. Since the day my husband received the mat, it holds a special place in the front of our studio. The way you took the images and pictures...and even our logo and incorporated/blended it all -- is just incredibly beautiful. As hoped, your design speaks volumes about our journey. It's like our scrapbook beautifully crafted into one image and of course, what could be a better place for it -- but on your yoga mat. Sure, I was concerned about purchasing something that I believed to be so personal and special - especially when it's for someone so special in your life. I sent you everything to use from photographs, publisher file images, clip art...kind of thrown together and at times replacing those I had already sent. I thought to myself at one point, if she keeps this straight and produces a somewhat decent mat, I would be happy. When I received the finished product and my husband opened it up, I was ecstatic. You managed to keep everything straight and work it all into a beautiful story - that means the world to both of us! As studio owners, we will absolutely keep you and your beautiful mats in mind whenever we need a special gift for a client or someone in our network. You are a pleasure to deal with, and I couldn't be happier with my experience in purchasing such a work of art from you. 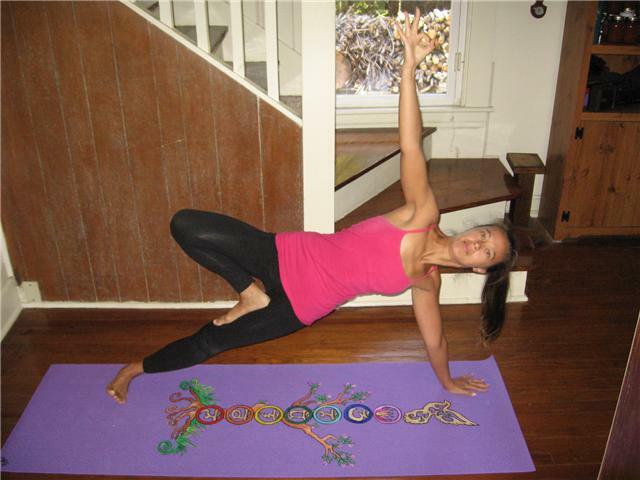 Namaste' Marianne My Yoga Place, LLC 494 Main Street, Suite 6 Monroe, CT 06484 PS We would love to link you to our site at www.myyogaplace.org. Please check it out and let me know. I wanted to get myself a mat for completion of yoga teacher training. The moment I told Aline this she looked at me and said "I've got it!". She asked me "is orange ok?" of course orange is one of my favorite colors. Aline had been a friend and client of mine so I had total faith in her intuition. 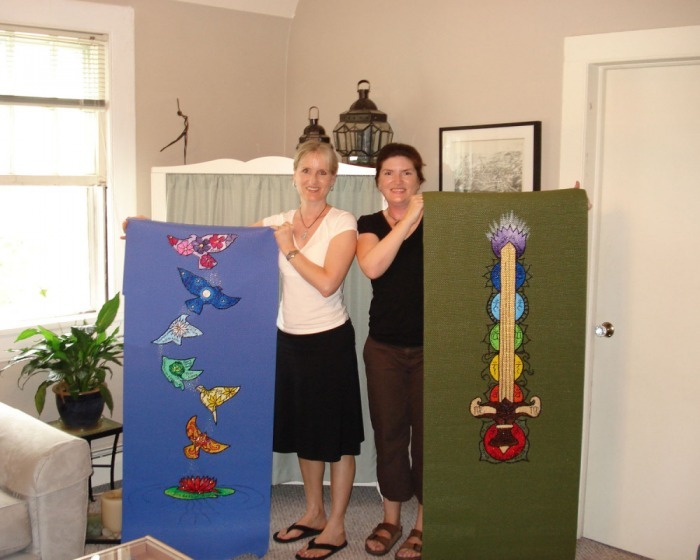 Two weeks later she sat down in front of me as I unrolled the "Intergalactic Warrior" yoga mat. Every mat comes with its own story whether it is custom made for you or a creation she manifested on her own. 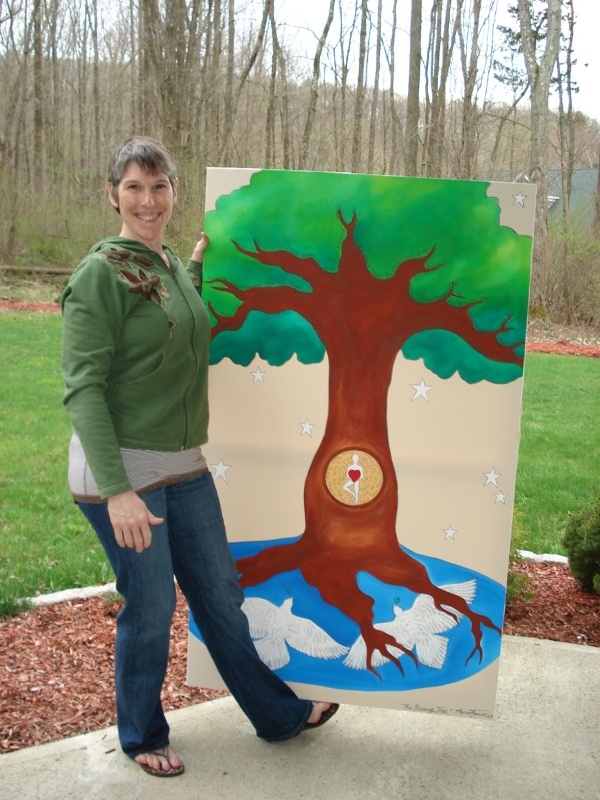 The story beautifully describes the many aspects of your new sacred space. There is nothing like taking a 10-breath down dog over Aline's work. My mat comes alive when I fully let go a get deep in to my practice. 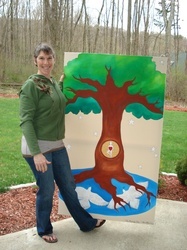 I have taken and taught around 200 classes on my work of art and it has become a truly sacred space. It has held up unbelievably (I want another one but can't let go of this one until it fulfills its dharma). Additionally there is a special camaraderie amongst those who practice on an Aline Marie creation. Mark Terza LMT/RYT, owner of Metta Massage Therapy. 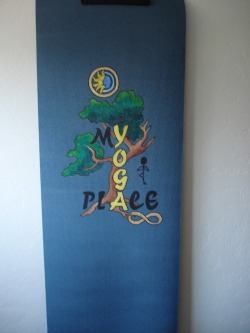 "I will tell you that I was the amazing lucky one to receive my yoga mat as a gift from the amazing artist ! Practicing yoga on the mat reminds me of who I am, what I stand for and that I am loved! 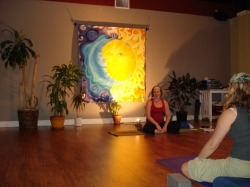 it brings an energy,light and confidence to my yoga practice -."